Highland Park, IL. North Suburban Synagogue Beth El. Entrance. Percival Goodman, architect of sanctuary, 1964; Bernheim and Kahn, architects of entryway, 1980s. Photo: Samuel D. Gruber 2016. Highland Park, IL. 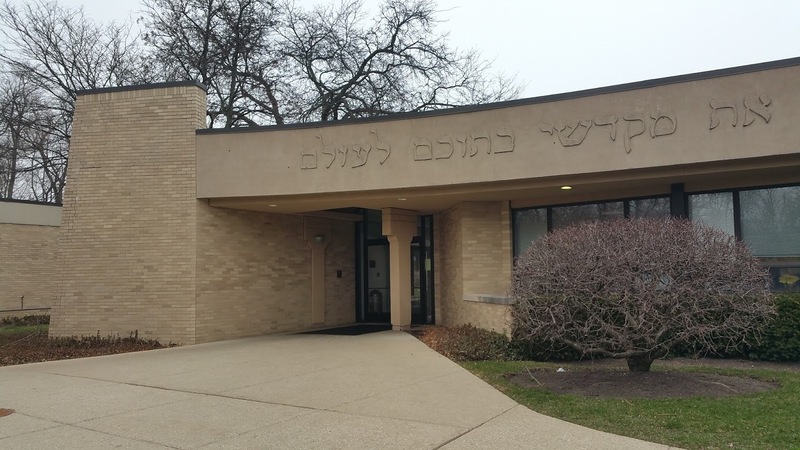 North Suburban Synagogue Beth El. Sanctuary. 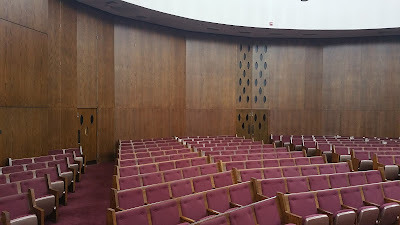 Percival Goodman, architect, 1964. Photo: Samuel D. Gruber 2016. 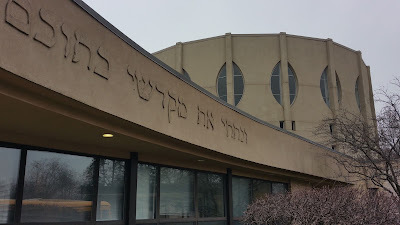 When in the Chicago area recently I had the chance to visit for the first time the North Suburban Synagogue Beth El (NSSBethEl) in Highland Park, Illinois. The congregation was founded in 1947, and after opening a new school building in 1953, built a community center and auditorium, where services were held beginning in 1957. 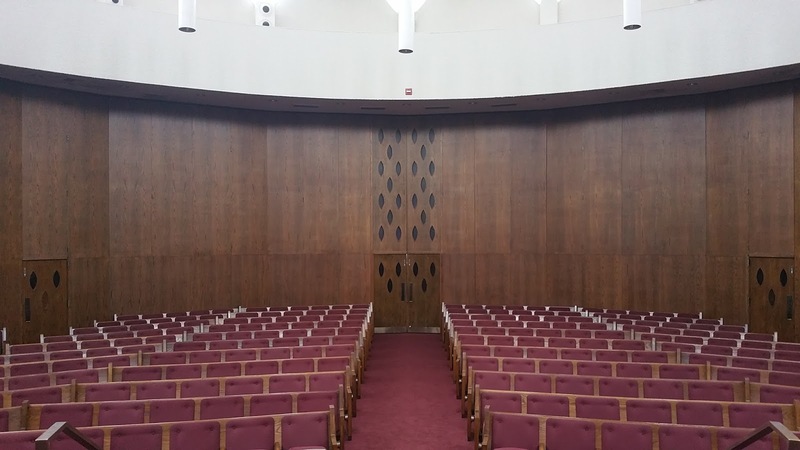 Only then did work begin for a purpose-built sanctuary, and this was designed by Percival Goodman and begun by 1962. 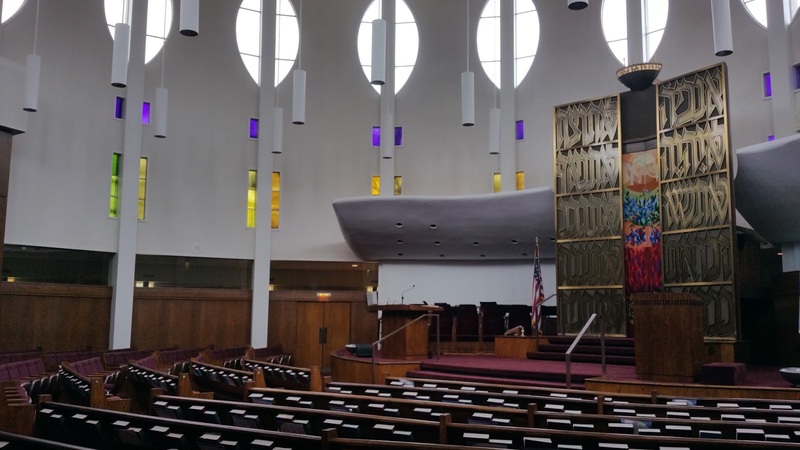 (Read history of the congregation here). Additions have been made to the complex in the years since, including a new and attractive entrance in the 1980s. Dedicated in 1964, the fine and distinctive building, referred to as "a jeweled crown" because of its shape and decoration, is too little known in the world of synagogue architecture, and certainly has been overshadowed by its near-contemporary neighbor, the North Shore Congregation Israel by Minoru Yamasaki. NSSBethEl, however, surely ranks among the best designed and best preserved synagogues of the 1960s. 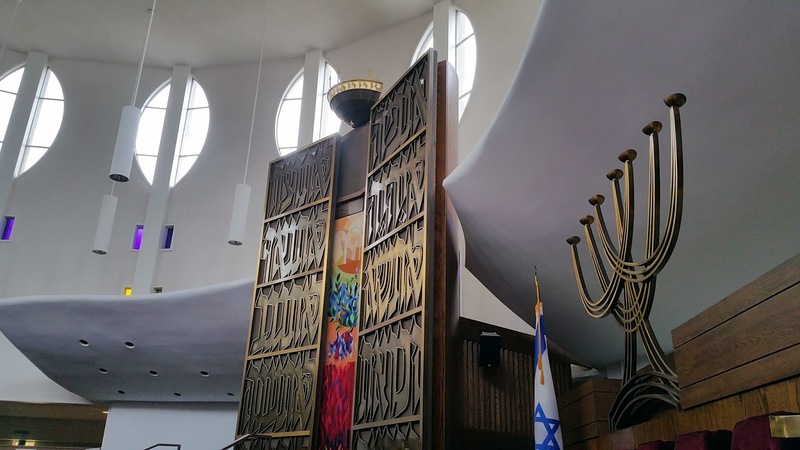 In addition to its architecture, it houses an impressive ark, menorah and other metalwork by Ludwig Wolpert. NSSBethEl is one of several synagogues of this period in which architect Goodman was clearly trying to come up with striking new designs in competition with the much publicized grand-gesture work of star (and not Jewish) architects Frank Lloyd Wright, Walter Gropius, Pietro Belluschi, Yamasaki and others - while maintaining the warmth and almost vernacular simplicity that marked his early work and adoption of everyday materials. Highland Park, IL. North Suburban Synagogue Beth El. Percival Goodman, architect, 1964. Photo: Samuel D. Gruber 2016. 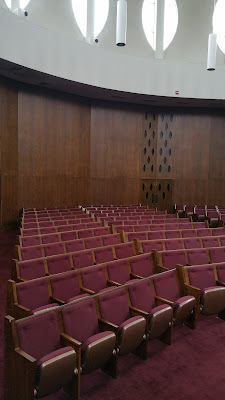 The key to the complex is a round drum flanked by a low sweeping entryway, around which is wrapped a sprawling complex. 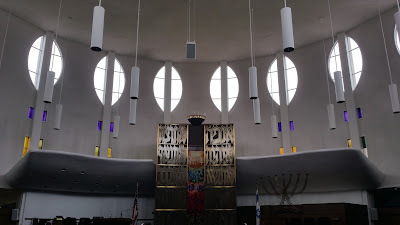 The drum appears to be made of pre-fab concrete slabs joined together (presumably around a steel frame), a technology not-unlike Yamasaki's use of pre-fab slabs at North Shore congregation Israel. The round drum recalls the contemporary sanctuary at Brith Kodesh in Rochester, designed by Pietro Belluschi and also completed in 1964. 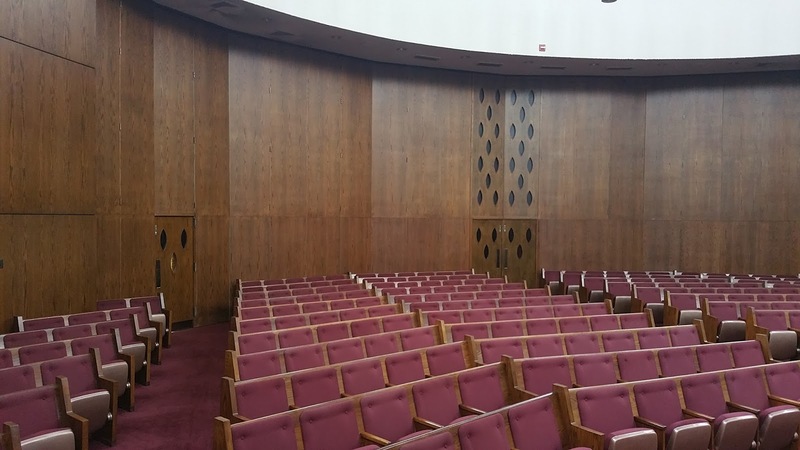 While round sanctuaries have their problems, it is worth noting the North Shore, overwhelmed by the size and grandeur of their huge 1960s sanctuary, built a smaller and round one in the 1980s, designed by Thomas Beebe, at the other end of their complex. The unusual window shapes, and the use of small rectangular openings filled with solid pane colored glass, recalls Goodman's use of color and light in the Fairmount Temple in Cleveland, Ohio (1957), and also recalls Philip Johnson's work at Congregation Kneses Tifereth Israel in Port Chester, New York (1956). Highland Park, IL. 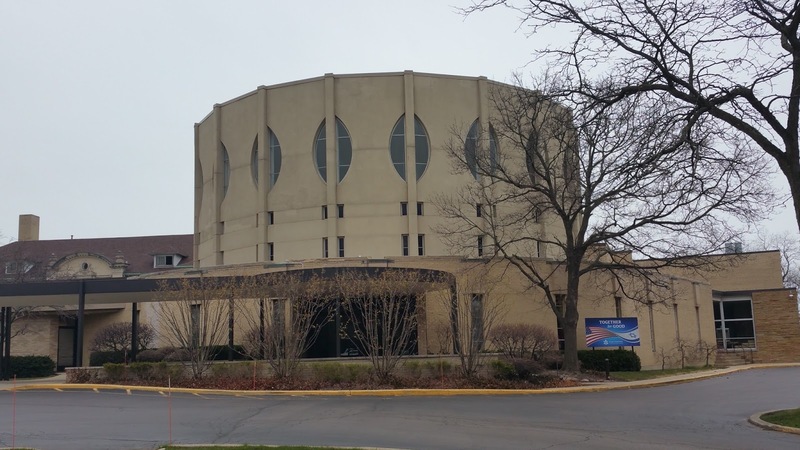 North Suburban Synagogue Beth El. Percival Goodman, architect, 1964. 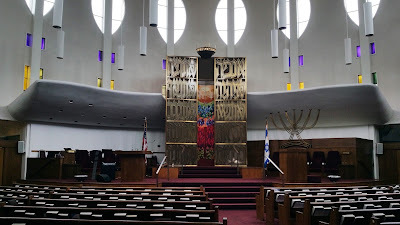 Ark and menorah by Ludwig Wolpert. Photo: Samuel D. Gruber 2016. 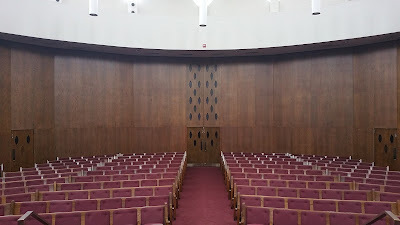 Despite the curved shape of the sanctuary space, the rear wall does slide open - with much effort - to connect the space with the social hall, a favorite device of Goodman to accommodate the difference in congregation size between Shabbat and High Holiday services. 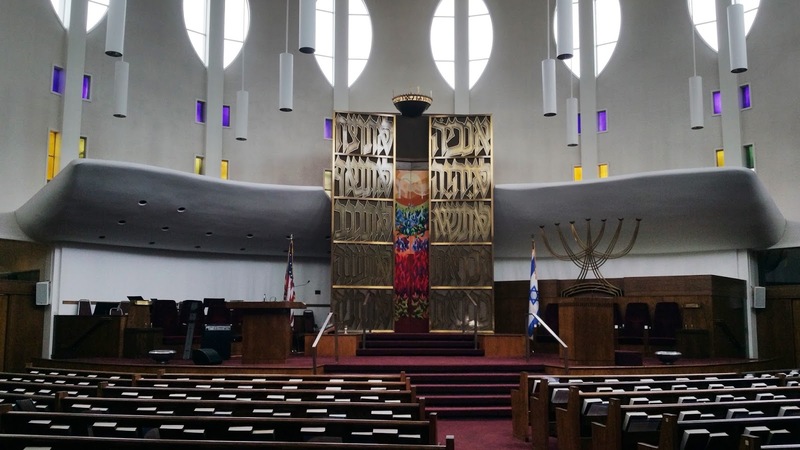 I want to thank the staff of North Suburban Synagogue Beth El for allowing me access to the building on very short notice, and for their dedication to maintaining this exciting work of mid-century modern synagogue architecture.